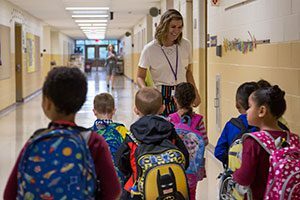 The Warwick Valley Central School District Board of Education recently held a special work session called “Human Capital” to take a closer look at its most valuable asset: its people. Human Capital is an organization’s most valuable asset – its people. In a comprehensive roundtable discussion led by Assistant Superintendent for Human Resources Cindy Leandro, representatives from virtually every corner of the District – from teachers to office staff to bus drivers – dissected the rigorous process by which the District recruits, hires, and develops the District workforce. The District is committed, said Superintendent Dr. David Leach, to the hiring and retention of top talent throughout the District. “We hire the right people, and then support them so they can provide our children with the best education,” he said. Over the course of the work session, board members and the 35 attendees reviewed the functions of Human Resources, with Mrs. Leandro emphasizing the strategic management of “human capital,” which refers to the collective value of an organization’s people and their skills, knowledge, creativity, and talent. In all, the District employs more than 1,000 people. This year, as many as 400 resumes were submitted for the elementary openings alone. Beginning with the hiring process, Mrs. Leandro introduced four new teachers to the School Board and emphasized the numerous stages of a hiring process, which begins with the submission of applications through the Online Application System for Educators (OLAS). There are panel interviews with other candidates and small interviews by committee, then, for finalists, interviews with the Superintendent and timed writing samples. Some of the interview process is formal and some is more conversational and relaxed, said Mrs. Leandro, and the goal is to gain a true sense of who the candidate is and what drew him or her to the profession. Finally, background checks and fingerprint screenings are completed. Then recommendations are made to the Board of Education. Hiring a stellar staff is just the beginning, said Mrs. Leandro, and the work session then focused on performance evaluation and professional development for each distinct group of District employees. Along with the evaluation processes, Mrs. Leandro emphasized the importance of supporting employees along the way through programs such as Mentor/New Teacher training. For example, teacher Amanda Melican, the Instructional Technology Facilitator at Park Avenue Elementary School, assists her colleagues with technology questions, visiting classrooms and co-teaching lessons. “I can help with programs and tools whenever a teacher needs me,” Ms. Melican said. Kevin Wilson, a second-year technology teacher, praised the District’s commitment to supporting its teachers. He said that not only did he receive extensive mentoring, but he has found that there is an “all hands on deck” mentality in the District, with anyone and everyone showing a willingness to help, from administrators to fellow teachers. “There was support everywhere,” Mr. Wilson said. And while the criteria for various job descriptions may vary a great deal, Dr. Leach told the School Board members that there are core traits that all candidates must possess.